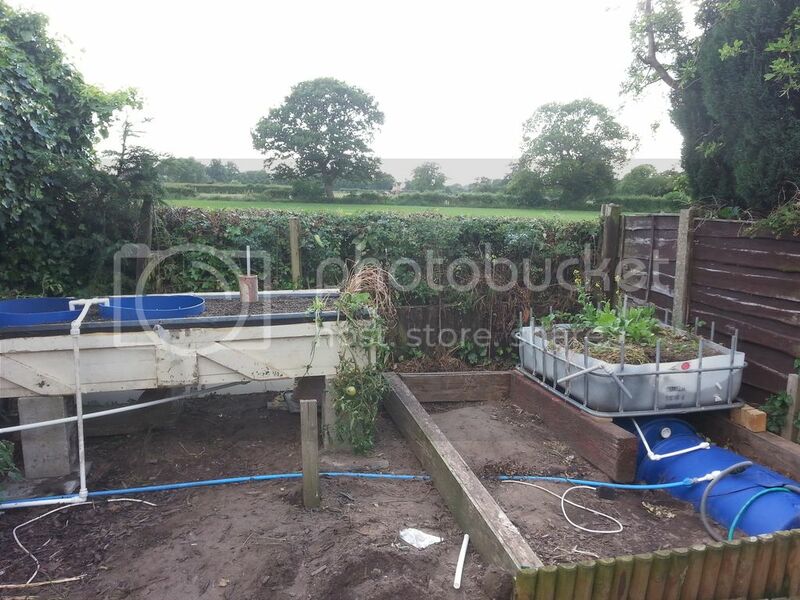 Re: ChilliJez Aquaponic Mission: House Move! The house move was forced upon us quite suddenly and I'm pleased to have got it done at short notice. A fair proportion of the plants will no doubt die but hopefully enough will survive to keep taking out the nitrates. The greenhouse will be dismantled next weekend and assembled around it. That'll be a joy to carry out. Duckweed has started to appear in ponds at the farm where I collect milk in the morning and I've started gathering it. I plan on having a separate tank to grow it in. It's quite nutritious for the fish and they like it. I can use it to take nitrogen out of the fish water if needed and otherwise feed it on hydro nute waste. Fish were eating in their new home which is encouraging. My concern is that the growbed timing isn't checked and may be too long or short. I ran it throught he cycle once and had to leave for work. One bonus of the move was fish discoveries. I knew we had 9 fish and was frustrated that we hadn't seen any evidence of breeding. Well I borrowed a landing net froman angling friend and got out the 9 fish but got 3 more tiny ones perhaps 1.5 - 2cm long so they had been breeding, if only 3 survivors. I went back this morning to search for more with the finer net and.. couldn't find the finer net! Doh! House move! I fished for more with the big net and caught 6 more small ones and then another large fish. That was a surprise. However, peering more closely, there are also a bunch of fry that I'll attempt to recover next weekend when I've taken down the greenhouse. If it's not clear what's going on perhaps I should clarify. The 2 blue barrels (free if you ask!) are full when the system is idle. The pump is in one of them and they're linked by a syphon tube. When the timer switches the pump on, it delivers water through the blue mdpe pipe to the fishtank sited now in the garage. The fishtank is already full so as water is pumped in it overflows down the white pipe to the growbed. 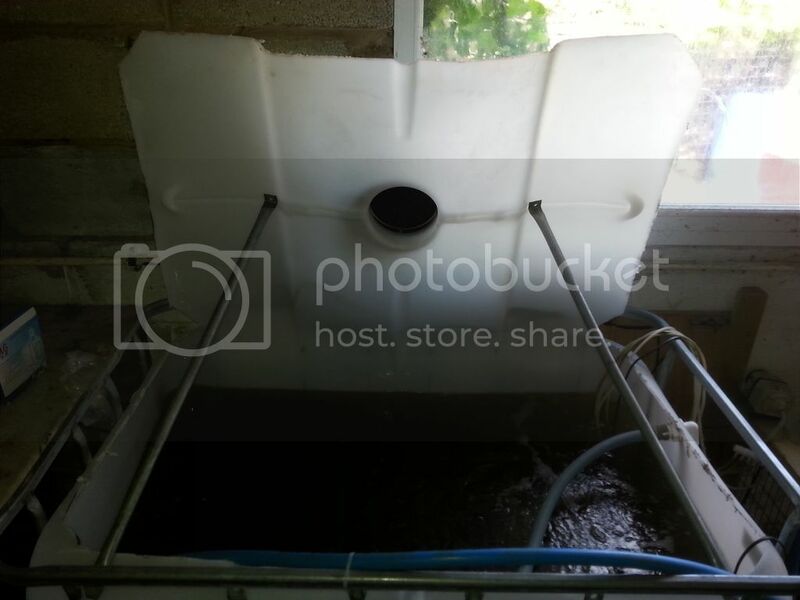 The growbed drain hole is smaller than the inflow from the fishtank so gradually it fills up. It drains into the blue barrel sumptank. When the pump timer switches off the water ends back in the blue barrels. Glad the move went well Jeremy. Amazing work getting the aquaponics set up so rapidly - and great news about the fry! Now that is interesting about the duckweed. Do you just add a little at a time so the fish munch it straight away? Good luck with the greenhouse - those roof clips are a pain even when the greenhouse is empty! Chilli Keith wrote: Glad the move went well Jeremy. Amazing work getting the aquaponics set up so rapidly - and great news about the fry! Duckweed stuff is received info not from experience, yet. Lots of protein though. It has to be grown in a separate tank or there is none left. We'll see. I'm with you on the greenhouse clips. However, if you consult that Ronan over there in Galway...well he jams his greenhouse so full that he has to remove the roof panes just to harvest. If you and I had that level of application perhaps we'd have made more of ourselves! Oh nice idea. I read somewhere that there is a type of lettuce that doesn't require oxygen - although guess the fish might need some! ChilliJez wrote: Duckweed stuff is received info not from experience, yet. Lots of protein though. It has to be grown in a separate tank or there is none left. We'll see. We did ours around the 26th January - I was up a ladder and it was raining. I certainly remember my numb fingers! Haha - I think we may need to figure something out for our tunnels to be honest. The Lemon Drops are already touching the curve of the tunnel and they haven't even settled in to their new 11l pots yet. I look forward to seeing Ronan's set up full to the rafters! Good job on the move Jeremy, and great to hear you are successfully creating and environment for the next generation! ChilliJez wrote: If you consult that Ronan over there in Galway...well he jams his greenhouse so full that he has to remove the roof panes just to harvest. If you and I had that level of application perhaps we'd have made more of ourselves! It's a pain, but necessary with the loss of height with the ebb and flood. It makes up for it in low maintenance etc. .....I guess. Good work to get it done so fast Jez. Not an enviable job. Congrats on the baby fish! ronniedeb wrote: Good job on the move Jeremy, and great to hear you are successfully creating and environment for the next generation! Ronan, I was jesting but it's exactly why I've changed from pumping up into the growbed to flooding down into it. My main reservoir (the fish tank) is now almost completely independent of the other stuff as long as the sump tank is below the growbed. Up to now the plants have been growing at chest height. Now at knee height. Actually, what they're probably doing is dying at knee height but the idea is the same! Ben123 wrote: Good work to get it done so fast Jez. Not an enviable job. Congrats on the baby fish! Thanks Ben. It's a little ecosystem and getting the fish reproducing feels like the last piece in completing the cycle so I'm chuffed! I went back to the old fish tank today. I'd had to leave an amount of fry there as I didn't have a net fine enough to catch them.Going back, there were far fewer than I'd left.Hey ho. I do what I can. It was too dark and I only fished out perhaps 4 or 5 before I could see nothing. They're now in a reservoir suspended in the main fish tank. The reservoir is a bucket with the bottom cut off and covered with net curtain material. Essentially it's just to allow me to get food to them without it being taken by the bigger fish. Here's an image of one that didn't make it. It's about the size of the 40 I bought a year ago to stock the system. Looked at side on like this they're quite silvery. Lokked at from above in a tank, at a depth of more than 30cm they're nigh on invisible. Tip to tail there he's about 1 cm long. I'm still in awe of this fish's ability to grow from this size to plate size in about 9 months. It's taken me, as a novice, 12 months or so but now I have big fish and babies so I can start harvesting. I hope to get to a position where I have a mixed age population and when it comes to the end of autumn I can harvest the bigger fish and keep the smaller ones to overwinter, powering a grow tent arrangement that I plan on setting up. I hope this will keep the system alive whilst managing costs through the cold dark days. What temperature do the fish need to maintain over winter? That's a cute dead fish Jeremy. Have you thought about Fried Whitebait? Seriously though, sorry to hear about your dead fry. In the end I bit the bullet and I've reworked the whole system. I've dragged the old growbed into place and raised it onto concrete blocks. The top is about waist height and just lower than the top of the fish tank so the fishtank can still overflow into it. This growbed is too big. It's 470 litres so the sump would be empty before the bed was filled to the right level. To work around this I've set 2 cut down barrels into it. 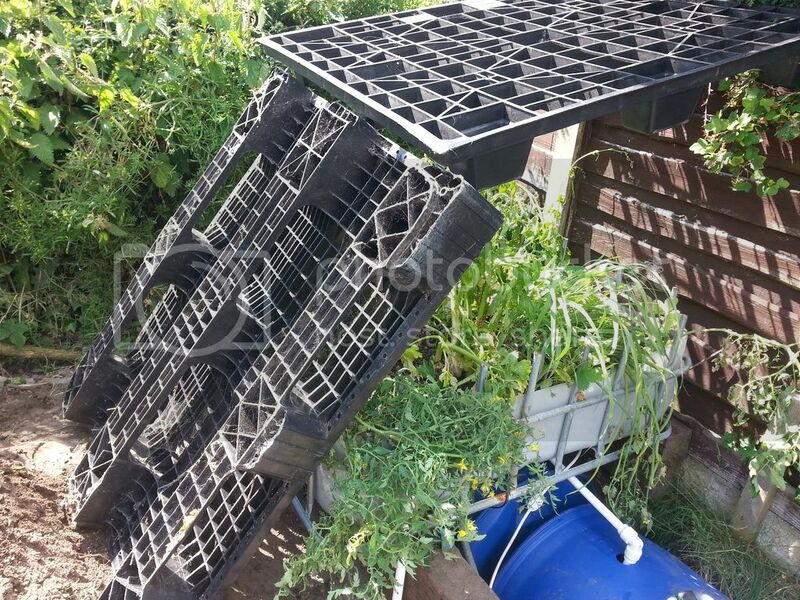 These can still work as growing area (lettuce on floating rafts or whatever) but they don't need to be filled from the sump capacity each time. 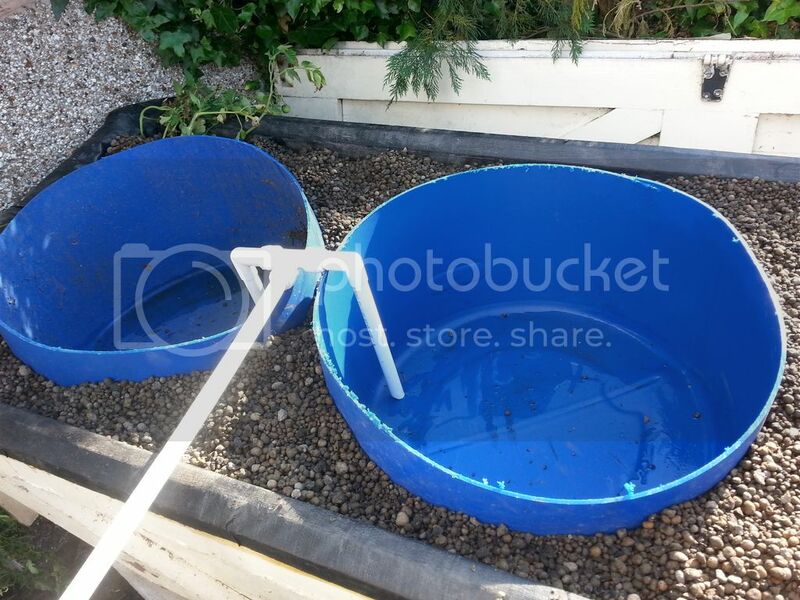 They are about 70 litres each so drop the growbed size to about 330 litres which is ok for the sump (just!) Water from the fishtank is delivered to them and they overflow to fill the rest of the growbed. The drain from the growbed heads back into the garage where I have a second IBC alongside the fishtank to act as a sump. I've transferred 4 straggly tomato plants as they survived the previous move ok despite having reasonable leaf area. Also I moved horseradish and sorrel, both thugs. The pak choi is all that's really left behind. It's already bolting so not worth moving. What I will be putting in is all my shockingly bad chillies from dwc and coir/clay pebble mix. These are awfully treated plants that are barely hanging in there so I don't expect them to fruit but if they do better here at least I'll feel a little less guilty! The virtue of this new arrangement is that I can see everything. The question is does it work? Answer no! I ran out of time yesterday, at which point the fish tank was filling quicker than the delivery to the bed. So I have to add a second delivery line or raise the fish tank, (like that's going to be easy!). Then hopefully all will be ok. I have about 3 hours this morning before back to work so it's a quick visit to Wicks when they open and some frantic plumbing! Are we having fun yet?! The tip that is the end of my garden. "What was that you said about the view dear?" Abandoned bed with mostly pak choi on the right. New bed on left, badly in need of some camouflage. The sleepers are laid out where the greenhouse will be. 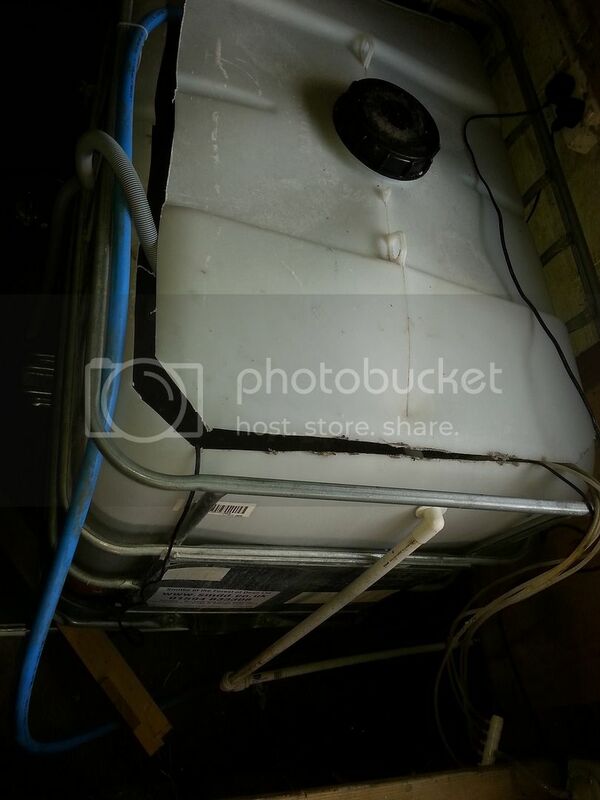 White pipes deliver water from fishtank to blue barrels. These will overflow to fill the rest of the growbed. In one I'll probably put lettuces on a floating raft. In the other I may grow duckweed to feed the fish. 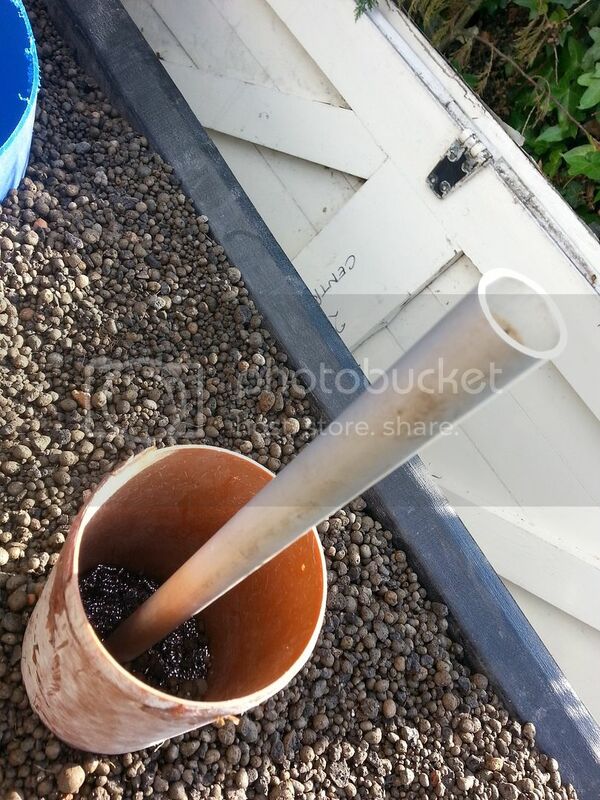 The guard round the drain tube is now 110mm soil pipe so I can get in there if needs be and the pipe is filled with stainless steel wool to keep errant clay pebbles at bay. Both learned the hard way. Nice set up Jeremy. I hope you get it up and running soon. Will you drain the system in winter? The soil there looks interesting. Is it sandy? Maybe good for asparagus? Hope the new set up works out for you in the long run Jeremy! Re: ChilliJez Aquaponic Mission: House Move!I came home from work yesterday to this fella. I came home from work yesterday to this fella. The fish do jump occasionally but he's the message that I have to get a lid on the tank. It needs to be done before winter anyway. 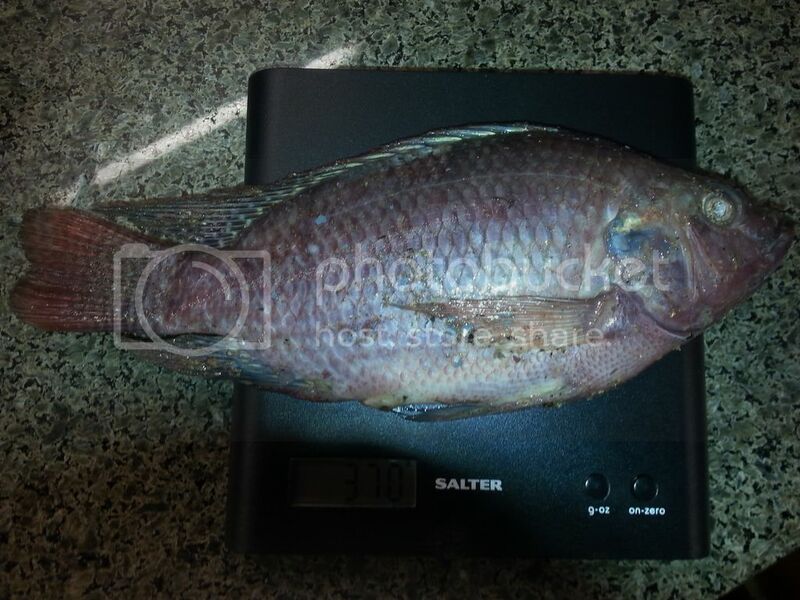 The fish weighed in at 370g which surprised me as I thought it would have been more. There's a 6" ruler for scale. The fish was as stiff as a board. I don't know how long it had been out of water. Too long to be safe to eat sadly. Re: ChilliJez Aquaponic Mission: A jumper! Maybe it wasn't dead, rather it had taken up planking?! It's a shame to lose such a sized fish Jeremy. How many are this big? I decided to google Rigor Mortis in fish out of interest and came across this regarding the effects of handling of caught fish on flavour. Thanks for the link Keith. I feel much better informed. There are 9 more of a similar size, about 15-16 tiddlers and a couple in between. The 9 big ones will be eaten before the end of the year and I hope to get the smaller ones into a smaller insulated tank with an insulated growing box alongside to house a few overwintering chillies and possibly a community cross F1 plant. I'm taking stock of this aquaponic thing that I've had going for about a year and a half now. It's coming to the end of the outdoor growing season. I have 10 or so pretty large fish in the tank and a few babies. I've been trying to weigh up if it's been worth it to be doing this. I can't justify the expense of keeping a large fish tank warm through the winter so I've decided to keep the small fish on in a much smaller tank and harvest the bigger fish to eat. That's happening tomorrow. Gulp! What's my overall view? On a pragmatic, veg and fish per pound spent basis, it's been unrealistically expensive. However, the amount of learning I've got feels invaluable.I would do everything differently but I would do it again and I would urge anyone else to do it too. The hardest part of getting this kind of thing going is establishing a balance in the mini ecosystem you're creating between fish, plants and bacteria. By keeping the smaller fish I hope to maintain a balance and build the plant and bacteria populations early next season and be more focussed on an efficient system that builds fish mass and plants more efficiently. 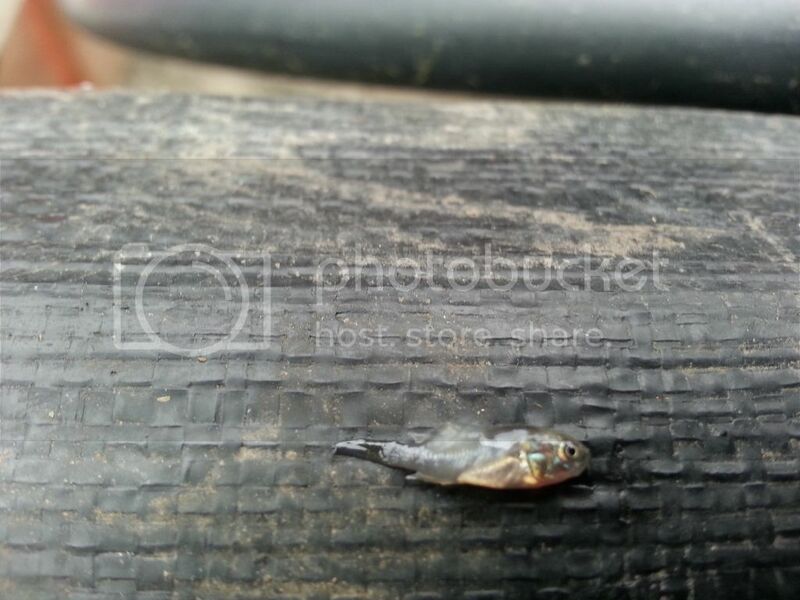 In the mean time my small fish in a small tank will power a plant or 2 in an enclosed overwinter insulated box. A grow tent with solid sides if you like. I'll post pics of the fish harvest tomorrow. You've done a great job with this Jeremy - and I've learnt a bit through following your progress, so thank you. If we get time and space next season we might have a dabble in aquaponics as I can really appreciate the educational value of balancing such an ecosystem. Fish on your plate sounds like a great success to me - good luck with dispatching them. Could they go straight into ice/the freezer to save a violent end? 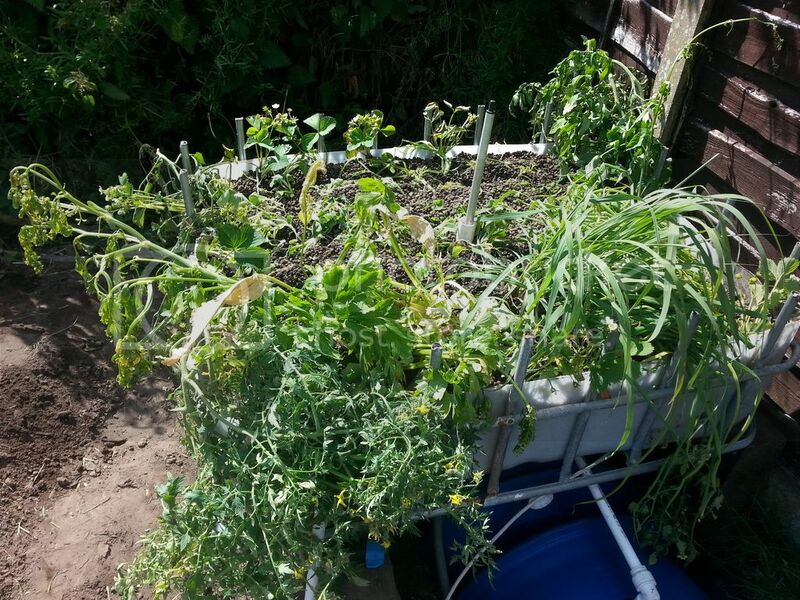 I've been following this since you first came up with the desire to try aquaponics and been amazed by the trials and tribulations and your resourcefulness. Whilst the output hasn't matched what you hoped for it has been really fascinating and now you have got through the challenging first season I hope getting through the winter in a smaller tank works for you and gives you a big head start for next year. Sometimes the challenge and efforts and what you learn from this is worth more than the actual value, and I have learned lots so thank you. I'm still struggling with chilli growing here in Oz but I'm positive that after a year of pests, bugs and disease that this year is going to be a big one! Keep the chilli faith! Keith, David, thank you for those comments. It means a lot. In the end I harvested just 2 fish of the 10. I'd switched off the heaters to cool the fish down and make them easier to catch and minimise distress. In scooping them up with the net I also netted a couple of dead babies. The water was pretty cool and I think it was too cool for those small ones so I got the heat back on. I had frozen some ice blocks so I could flip the fish into a cool box filled with iced water. I'd trawled youtube videos about the most humane way to do the deed. It's just another of those things where it works for them out there but not for me. I thought a half hour in water at 0C would kill the fish but no. The first fish was definitely moving which I found unnerving so I put it in the freezer for an hour. At that point it was stiff but the fins were still moving! I took a chunky knife and cut through the back of the head and through the spine. Lots of blood! The second fish was more active. It was still moving it's mouth after a half hour in the iced water. I went straight for the knife to the head and then left it for a while to calm down. Job done but I want to learn better how to do it the right way. Tomorrow I hope to recover some live small ones to a separate tank then harvest some more into better iced water. 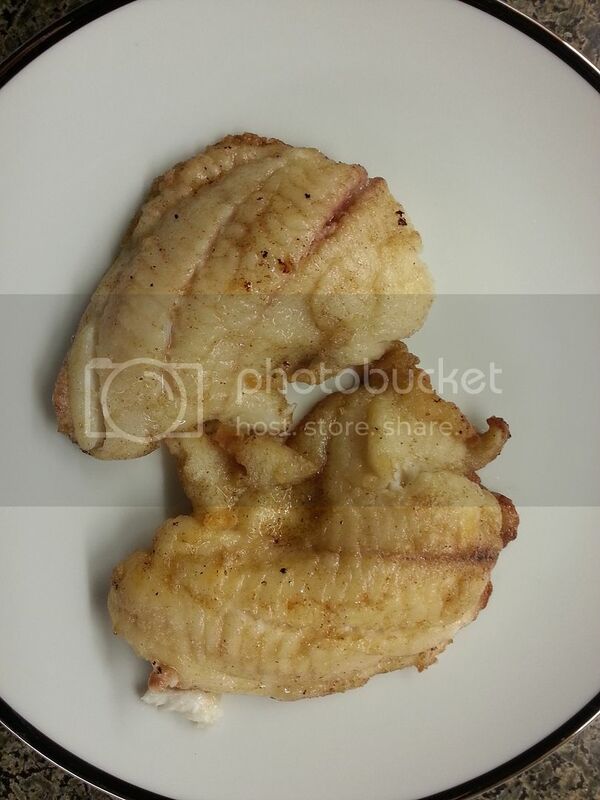 The fish itself is good, fine unremarkable white fish. It's just like plaice. Not quite enough texture to be interesting. I have to say that I hate fish. I really hate most fish. Going near the fish counter in the supermarket makes me gag. I've discovered that it's not the fish I hate, it's the decay. I seem to be super sensitive to it. 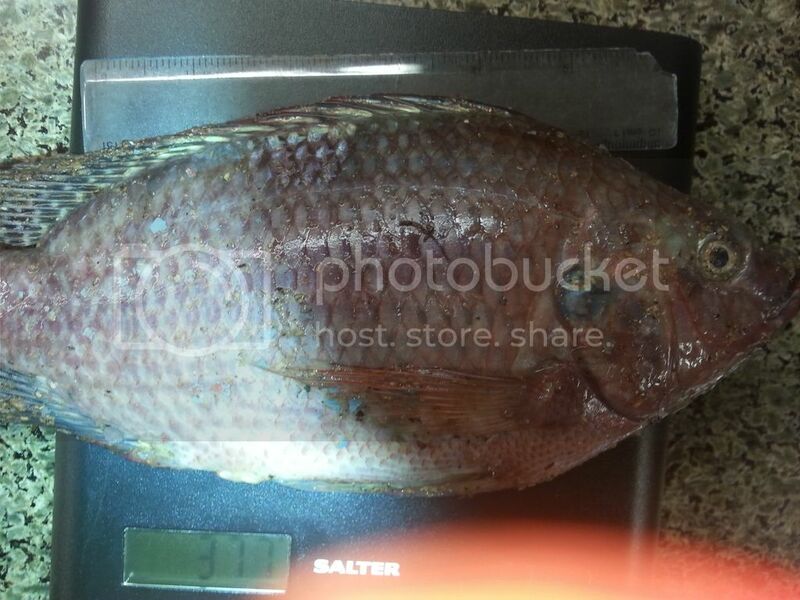 I was hoping that keeping tilapia like this would be a route to more fish in my diet. Sadly, it's just a bit bland and boring. That 37% was from commercial sources so there may have been recovery of flesh other than the main fillets. I boiled the remains for stock that isn't included. Good job Jeremy. I have killed lots of things - and the more I did it the more I valued life - and the harder it got. Halal done properly (I'm guessing not with fish) is really quite amazing and a peaceful drift asleep. A friend slaughtered a goat once - not halal as such but ceremonially. They calmed the goat by laying it down and stroking it, then used a razor sharp flint to cut it's jugular - immediately covering the wound with a hand to allow the goat to calm again. Then slowly allowed blood to flow through her fingers as the goat drifted into unconsciousness. Such a thoughtful and respectful end. I hope you find a kind method Jeremy - it may be found in the religious texts or ceremonies of an obscure and grateful people. 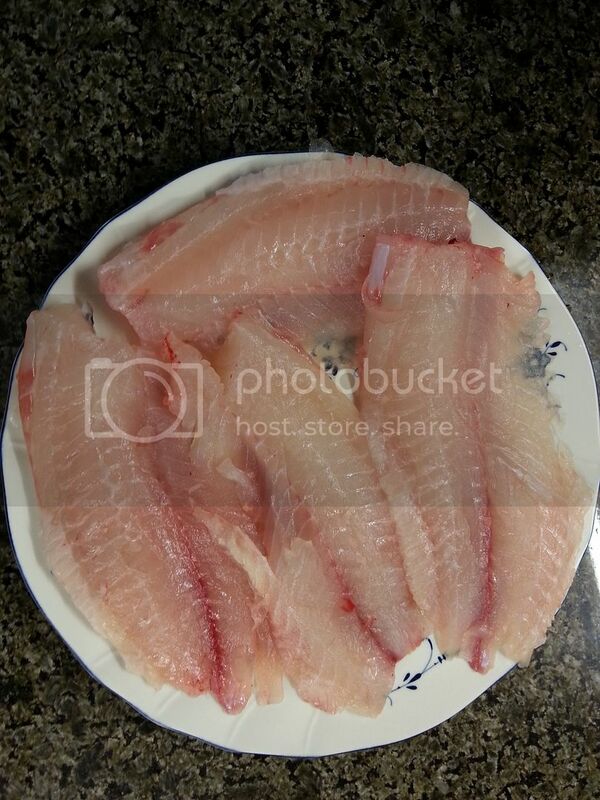 Can Tilapia be eaten raw, hot or cold smoked? I'm not a fish fan but can eat smoked salmon until the cows come home! Jeremy. Like the others have said, it's been great following your aquaponic adventure. Hope to see you back at it soon, at whatever scale. That's a fine fish, even if you weren't blown away by the flavour. Well they're all dispatched. These last 5 averaged over 700g which is considered the harvest weight so that's satisfying. I've kept 3 fish; 2 that are about 200g and one tiddler about 4" long. I haven't sexed them but if there's at least one of each I'll warm the tank they're in in the spring to get them to breed. They're now in a 120 litre tote. 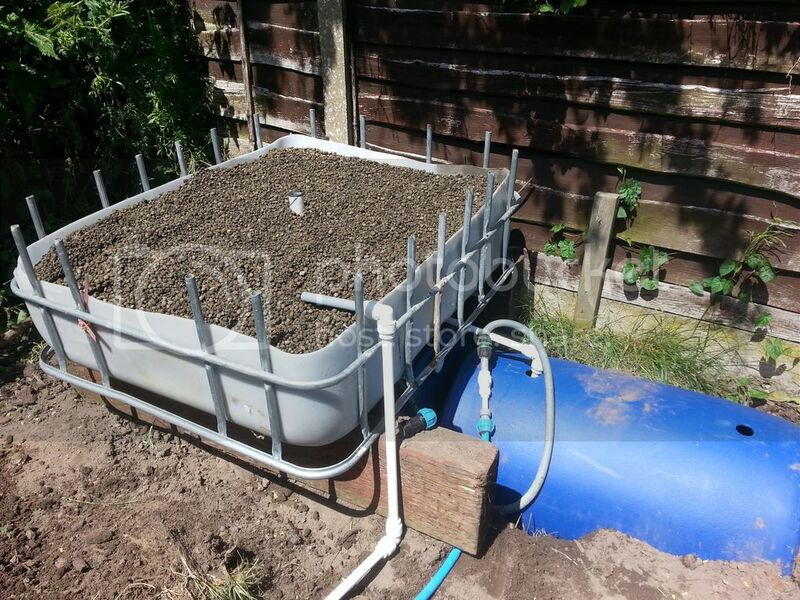 The water is being circulated through a similar sized growbed (underbed storage from ikea) It's flooded but filled with clay pebbles to maximise the surface area for bacteria. More pics to follow.